This is from a separate, folded brochure included with #65001 (2014 Cargo Train) & #65002 (2014 High-Speed Passenger Train). I want to make the larger layout & have all required tracks but would like to know the area it takes up. Any fellow engineers have this current setup, can you measure for me? Id prefer not to dismantle my current homemade setup to determine it. Each straight track is 16 studs, or 5". Four curved tracks are approximately 13.5" in length and height (16 curved tracks make a 27" diameter circle). 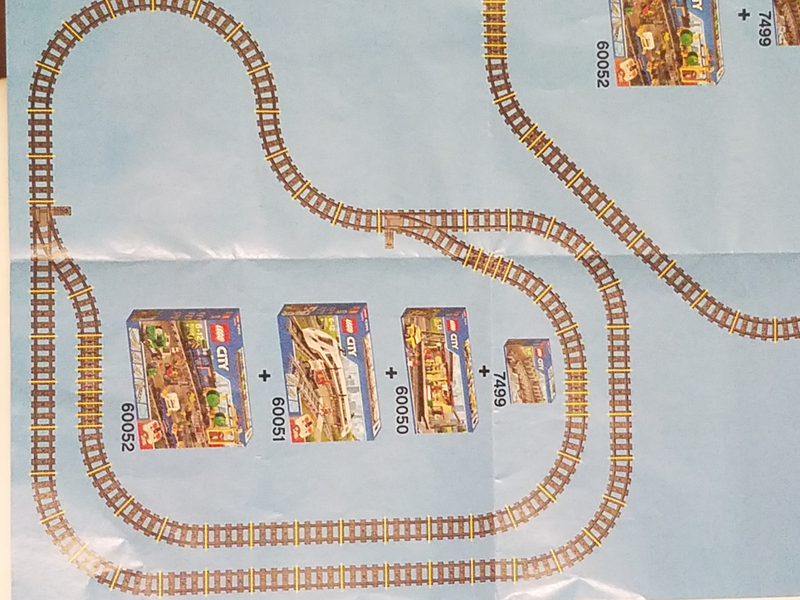 For this layout, the bottom portion of the track is 4 curved, 8 straight, and 4 curved, or 67". The left side of the track is 4 curved, 8 straight (two of those being the switch track) and 4 curved, or 67". Assuming you wouldn't need the adjusted lengths for the upper right corner, your layout would be approximately 67" x 67". OK great, I mustve measured wrong cuz I got 5'10" x 3'9". Now that I look closely, is IS closer to a square than a rectangle.